How can I delete video files or move them to an sd card? Post subject: How can I delete video files or move them to an sd card? 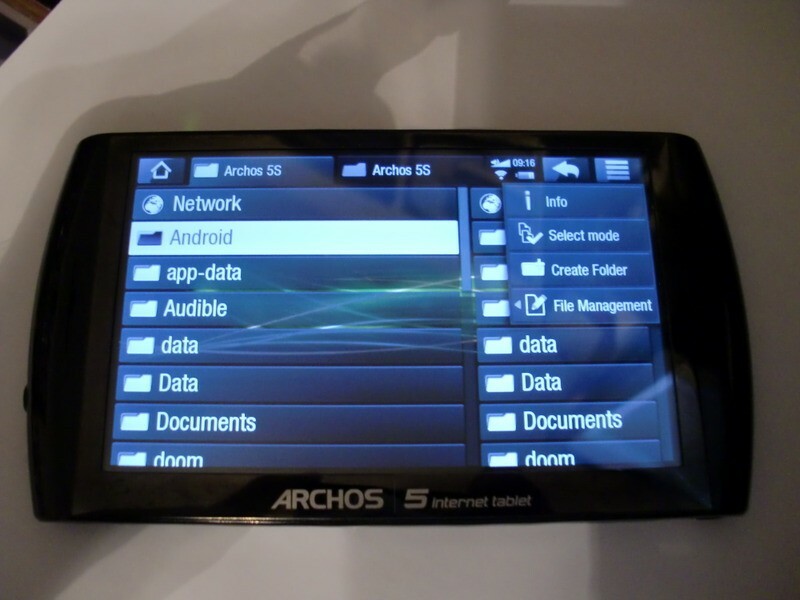 I have an Archos 5 which I have hardly used as I find it very difficult to understand the instructions! All I need it for is to record TV programmes and then copy them to my laptop so I can watch them later. I have a few programmes I want to copy, plus a load of early failed attempts when I was setting it up. There seems to be no way of deleting any video files and also no way to copy them to an sd card. I have bought and inserted a micro sd card. When I open the file manager I can see the sd card on one side and my files on the other but have not been able to move any of the files. I have tried to install some recommended apps which are supposed to help move files but each time I have tried I get an error message saying the app has not been installed. Post subject: Re: How can I delete video files or move them to an sd card? There is an application on the device, which should be present on your desktop as the unit was received by you, or can be access from the "pull out" applications window if you prefer. It is called "File Manager." This can be used to move, copy, rename and delete files. It's pretty self-explanatory. There are two "panes"... a left-hand one and a right-hand one. You browse through one or both panes (you do both if you intend to move or copy). You find the file (or folder) you want to do an operation on. And then you click the "menu" button in the upper right of the screen. The menu shows "Info," "Select Mode," "Create Folder," and "File Management" if you have a folder selected. File Management shows an arrow which indicates that it has a submenu (or several choices). If you have a file chosen, there's a fifth item, which by default is "copy" but also allows "copy all" and "move." The "File management" allows you to "rename" or "delete" if you have a file selected OR if you have a folder selected. It's almost completely self-explanatory. You just need to remember "go to the menu." By the way, you can also "drag" from one window to the other, which allows you to copy and/or move files. The file/folder ends up at whatever level you have open, not "within" whatever level you drag it on top of, though, which isn't 100% self-evident. Hi, many thanks for your detailed answer. I have tried this with the File Manager but unfortunately I do not have the "File Management" option, just "Info," "Select Mode," and "Create Folder". So all I am able to do is view the files, select and unselect, go back to the navigation mode and create a new folder. I am also unable to drag and drop any of the files. Is this a problem anyone has heard of before - do I have a faulty Archos or do I need to download some new firmware? I haven't used it for a year so it might be out of date? There hasn't been a new firmware for ages. If you were up to date a year ago, you ought to be up to date today. That said, it couldn't HURT to reinstall the most recent firmware. I presume you have an Archos account, and know where to download the firmware from the Archos website? I suspect, strongly, that either (a) you just overlooked that last line, because it looks like it's some other item, or (b) your firmware has become corrupted, in which case, reinstallation should fix it. At this point, if you click on "file management" you'll see "Rename" and "Delete" present. What's there is "contextual" in nature... different locations, and different types of files, result in different options being available. Hi, thanks again. I am definitely not seeing File Management - my list stops at Create Folder. If I have time I'll post some photos later but am heading off on holiday tomorrow evening - hence my urgency trying to get these video files transferred! I have registered my Archos and it says the firmware is up to date. The other problem I have is that I can't connect it to my laptop - the laptop doesn't recognise the Archos even though I have the latest Windows Media Player. So I can only assume there is a problem with it - I don't want to lose the videos I've recorded so can't reformat it (which is what my laptop keeps wanting to do!). I have just downloaded a couple of file management apps from the App Library and will have a go tonight to see if I can transfer my files to the sd card using one of them. I seem to recall that you needed to register your Archos 5 for File Management to show up. As I suggested, if you have somehow corrupted your firmware, which is the only possible explanation (unless you're not really registered, but you say you are, right?)... reinstallation of the latest firmware should fix that. Bear in mind that nobody's getting PAID to help you right now, nor is anyone here an Archos employee. Just "peers" telling you good advice. So, please go to the Archos website, confirm that you're still "in the system" as registered (if not, fix that), and then download the latest/greatest firmware, and reinstall it. And please confirm that the "no file management" thing occurs ON THE FOLDER I SHOWED YOU, SPECIFICALLY. Remember, I mentioned that this is "context-specific." I can imagine that if you, for example, were to attempt to do certain things to, say, an SD card which was "copy protected," or perhaps damaged or corrupted, certain options would not be available. Ultimately, I've given as much help as I can... and if your device really isn't working at this level, and if you've actually tried doing what was suggested (and it sure sounds like you disregarded my suggestion to reinstall the most recent firmware, frankly)... you're out of luck. Thanks again for your help, I hope I didn't come across as ungrateful! You can use Android data eraser tool to help you delete video files from Android device. With it, you can choose to erase the deleted files or the whole data on your Android phone at will.